What began nearly a year ago – my giant countdown of my 100 favorite films (circa early 2009) is trudging toward the finish line, as No. 26, Arsenic and Old Lace, recently rounded out the back-75 of the list (see that colorful array of film titles to your left for reference). And as we close in on the tops of the tops (at least in my humble opinion) bear with me for Journalistic Skepticism‘s 25 Best Films of All Time. 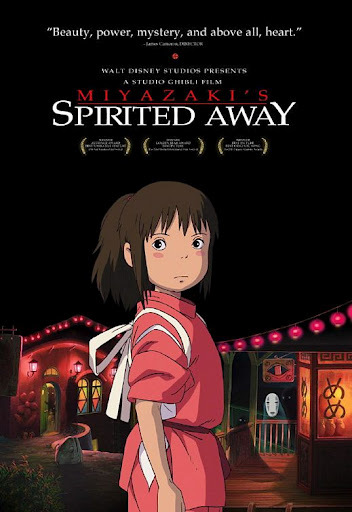 In the spirit of Hayao Miyazaki‘s great genius, the beautifully drawn and expertly written Spirited Away introduces us to a complex world of adventure and intrigue, where a simple bath house serves as a subcultural hotbed for restless spirits from all walks of life. As Chihiro ventures into this alternate world following an uncomfortable pig-related incident with her gluttonous parents, we’re whisked away along with her as she attempts to find her parents, revert them back into humans, and makes a few friends along the way. Perhaps the most brilliant thing about most all of Miyazaki’s movies is that while animated films from the likes of some American studios (DreamWorks Animation, ahem…) tend to shy away from subject matter that can interest both young and old, and other studios (Pixar, for one) sometimes cater even more toward their adult clientele, Miyazaki’s Studio Ghibli takes thoroughly kiddish fare and convinces adult audiences to be interested out of sheer visual pleasure and plot-driven intrigue. They’re often fairy tales with darker twists – and though our hero in this case is a little girl, we find ourselves relating to her in the strangest ways. Her adventuresome spirit, her disgust over a crummy job (bathing truly grotesque and muddy spirits, for one), and her drive to rescue those she loves – what more relatable qualities can one muster? Add to that the fact that Joe Hisaishi provides a typically wonderful score to set against the stunning visuals dreamed up by Norobu Yoshida and Yoji Takeshige, and you’ve got yourselves an absolute gem of a film. While others like My Neighbor Totoro, Ponyo, and Howl’s Moving Castle have provided commendable amounts of brilliance, it’s this particular masterpiece from Miyazaki that leaves the most lasting, most compelling impression.